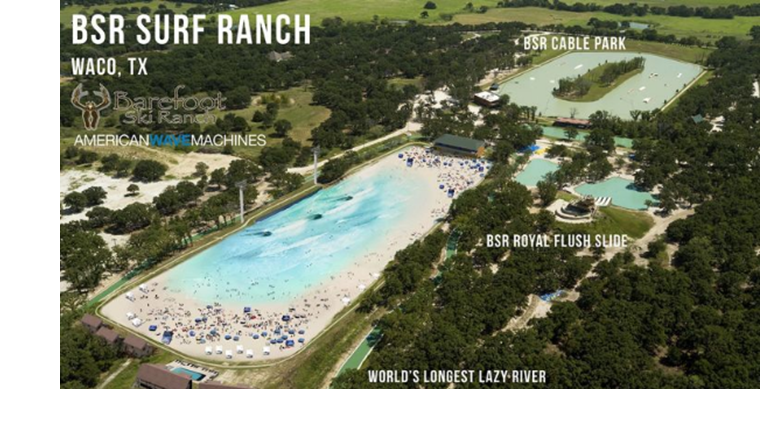 ​​​​ WACO - BSR Cable Park is planning Texas' second inland surf park, complete with white sand, digitally controlled waves, and surf pros teaching lessons. It will be a multimillion-dollar "surf ranch" where you can catch an 8-foot wave or watch a surfing competition. The BSR Surf Ranch follows on the heels of the 14-acre NLand Surf Park that opened last month in Austin. The BSR facility will be slightly smaller at five acres, including two acres of water. Owner Stuart Parsons has worked with his family to turn part of a 500-acre ranch into a multifaceted water destination. In the past few years, the facility has added cabins, a restaurant and a 3,600-foot lazy river. This summer, the park saw 8,000 to 12,000 visitors a week, making it one of the biggest tourist draws in the county.